Get ready for the 2011 Annual Meeting and Convention at the Albany Ramada Plaza Hotel in Albany, New York! A crossroads of the New York Central, featuring the Boston & Albany, as well as the the Hudson, River, and Mohawk Divisions! Albany was once home to large passenger terminals downtown and in nearby Troy. Come join us in this historic city as we celebrate the history and heritage of the New York Central System! 2:00pm to 6:00pm – Tour of HO scale model railroads, incuding Vic Roman’s New York Central Hudson Division from Albany to Tivoli; Jim Cesare’s Rennselaer Engine Terminal to Amsterdam; and Henry Propst’s Mohawk Division from Albany to Utica. Tour of O scale model railroads, including “Rocky’s Rambling Railroad” by Harold “Rocky” Rockowitz; Fil Fillion’s freelanced railroad; Don Klose’s Bellevue & Schenectady Railroad, and Jim Policastro’s Central New York Railroad. Directions to visit these layouts will be provided upon registration. Be sure to have your convention ID badge when visiting these layouts. 7:30 am to 5:45pm – “Adirondack Flyer” excursion on the Adirondack Scenic Railroad. 104 mile round trip from Utica to Thendara, with box lunch. Board buses at hotel at 7:30am. 7:45pm – Welcome by NYCSHS president Darwin Simonaitis, followed by brief remarks from NYCSHS officers. 3:00pm – Programs end. Thank you for attending! 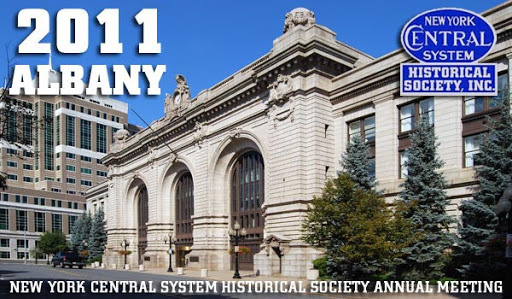 – Non-members may register for $154.00 plus $39.00 extra to cover your one year membership in the New York Central System Historical Society, which provides all the rights and priveldges of membership, including four issues of the Central Headlight. Albany Ramada Plaza Hotel — You are responsible for making your own accomodation reservations. Rooms can be reserved at the special Convention rate of $89.00, but you must mention “NYCSHS” to get the rate. Early reservations are a must as only 80 rooms have been set aside on a first-come, first-served basis. Call the hotel directly at (518) 438-8431. Complimentary shuttle from Amtrak Albany-Rennselaer Station for hotel guests upon request.